Yamaha Corporation of America (YCA), in cooperation with the U.S. Consumer Products Safety Commission (CPSC) has announced a voluntary recall of a small number of the Piano Benches sold between January, 2009 and November, 2016. This voluntary recall has been initiated by YCA after it was informed that paint used on the interior storage compartment surfaces and the bottom of that compartment of approximately 900 piano benches contains lead in excess of the limits set forth by regulation. Children should not touch these areas of the bench. It has been determined that some of the piano benches identified below may be impacted, therefore, YCA is recalling all of those benches identified below. YCA will provide the consumer with a new, fully compliant piano bench as a replacement at no cost. None of the piano benches being recalled were sold as a stand-alone product. The piano bench, Model No. 3 I PM / PAW, was provided with the Grand Piano Model GB1K PM / PAW. The Grand Pianos were sold from January 2009 until November 2016. Your Yamaha Grand Piano is not part of this recall. The paint on your piano is fully compliant with United States lead in paint standards. Click here for view additional information. Q1. Is my piano bench paint a safety hazard? The piano bench exterior paint is compliant with United States lead in paint standards and is safe. However, the paint on the bench's interior compartment and bottom of that compartment has paint that contains an excess of lead over United States lead in paint standards. Children should not touch the bench's interior compartment's surfaces or the bottom of the interior compartment. Q2. Is there anything wrong with my piano? No. Your Yamaha Grand Piano is not part of this recall. The paint on your piano is fully compliant with United States lead in paint standards. Q3. What if I don't want to replace my piano bench? That is your decision. However, it is strongly recommended that you take advantage of this specific Recall. You will receive a brand new, fully compliant piano bench at no cost to you. Q4. 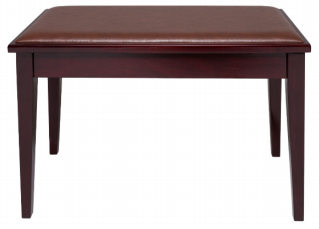 How long will it take to receive my new piano bench? After you contact YCA, we will obtain your contact information. We will then ship to you at no cost your replacement bench along with Return Packaging information. We will email you the prepaid Shipping Label to ship the old bench back to YCA. At no point will you be without a piano bench for your Yamaha Grand Piano. There is absolutely no cost to you in this process. Q5. How much lead is in the paint? Unfortunately, the test results varied significantly. However, we do know that specific areas of the interior compartment of some benches tested over the lead in paint regulation. The glossy paint on the exterior of all of the benches was and is fully compliant. As a precaution though, we are recalling all benches. Q6. I have a different Yamaha Piano / Bench / Keyboard. How do I know there is not too much lead in the paint? Yamaha is very diligent in ensuring the safe use of all its products. No other Yamaha models or products are included in this recall. As we test all of our products, you can be assured that your product is safe and fully compliant with all regulations and standards. Click here to view a list of piano models and serial number ranges. Reference the diagrams below and examine the bench model and manufacturing date. The first photo is of a Yamaha No. 3 I PM piano bench with the bench&apos;s storage compartment top closed. The second photo is of Yamaha&apos;s No. 3 I PM piano bench with the bench&apos;s storage compartment top open. 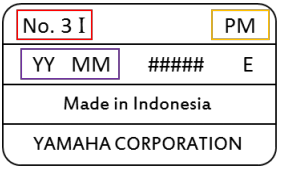 The white circle identifies the location of the label containing the bench&apos;s manufacture date code. Piano Bench Model No. 3 I PM / PAW, with manufacture date codes ranging from 08 07 through 16 08 "YY MM" indicating Year and Month of manufacture are subject to the recall. 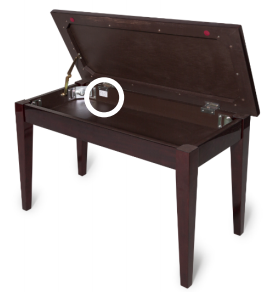 See photo below of label in the bench&apos;s interior compartment and how to identify which benches are being recalled. To submit a claim, please complete the form below.